For as far as I can remember, I have always known I had Sickle Cell Disease. My dad is a doctor and my mom is a nurse so from a young age I have always understood some basic concepts about the disease. What I did not understand however, was why it had to be me. But I thank God for my life, my family and how far He has brought me as an individual. This disease does not just affect a person. It also affects their family because when a child is in pain, parents are also in pain. Parents cannot sleep until they ensure that their child is well. I don’t remember much from my earlier years, but all I know is that I did not fall sick until I entered senior high school. Even though I never had any episodes of crises in my primary and junior high schools, I was limited in my participation in sporting activities, which I understand now, but I did not then, which ten year old boy would understand if you told him he was not allowed to play football? The difficult part of this disease for me started while I was in senior high school. I attended Presbyterian Boys’ Senior High School as a boarder, this is a fairly decent school. However, I had an episode of crises almost twice every term. This made high school very difficult for me because it usually took about a week for me to recover fully and return to school. Along the way after one such episode, I returned to school from the hospital just to return to the hospital because I started experiencing severe pain in my right hip, I was unable to walk, was taken to a hospital where I was informed that I had developed something known as avascular necrosis of the femoral head which apparently, is a common complication of sickle cell disease where blood supply to the head of the femur in impaired resulting in the death of the femoral head. I was relieved of my pain, and scheduled for surgery a year after but I had to return to school in crutches. Now some may ask why I was a boarding student in the first place. The answer is simple, I completed junior high school in the northern region where my family stayed at the time and so had no options than to be in the boarding house. I will leave it to you to imagine the inconveniences and difficulties of going through boarding school with crutches and all the while being in pain. But I did survive, I had my surgery on the 17th of August 2007 at the Effia Nkwanta Hospital in Takoradi. The dead bone was removed and I had to stay at home for about six weeks to recover before I could return to school. However, I still had to return to school with crutches since the limb had not fully healed. To cut this aspect short it was a very difficult time in my life, I even fell sick before my WASCE biology paper and had to come write the paper from the hospital, but God being so good I was able to make it past these difficulties. I stopped using crutches after senior high school and am now able to walk on my own. I gained admission to the university of Ghana Medical School after going through one year of biological science. God being so good, the frequency of crises reduced to one crisis a year and I was actually able to excel in most of my exams in medical school. I have gone through six year of medical education and I can say to the Glory of God that I am a medical doctor now. Dr. Anemana- My Sickle Life. I just want to conclude by saying that indeed this is a difficult disease to live with for those who have it, but it can be managed. The severity of symptoms vary from person to person, being serious for some and mild for others. This disease does not in anyway limit you from pursuing your dreams and goals. No one determines the limits but you. My life has been difficult, I went through very difficult times but today I am here. If I am here so can you. For parents please try to know your status and that of your children as this is very helpful. And please consult with a doctor for more information about the condition. I am thankful to the Lord for how far he has brought me, for without him I do not know where I will be now. I will also like to thank my parents for being there for me every step of the way, finally I will like to thank Mr. and Mrs. Dwamena who helped me through the difficult years in high school and all those who have supported me throughout the years. Thank-you. Submitted by: Dr Anthony Anemana. Dr. Anemana is a person living with Sickle Cell Disease and a real inspiration to many through his selflessness and excellence despite his challenges. 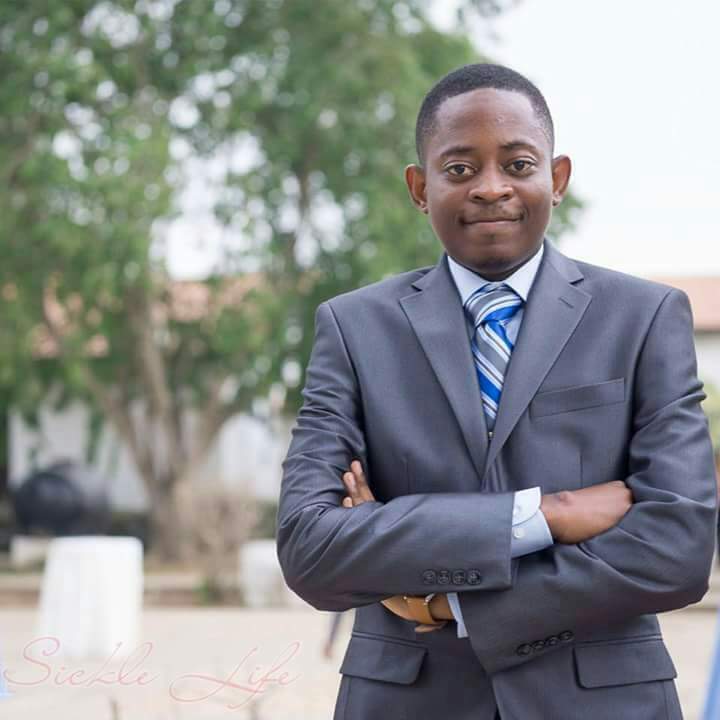 He is the overall best student in Surgery for the University of Ghana School of Medicine and Dentistry, Class of 2015. This clearly shows that having sickle cell anemia does not define what you can achieve in future. God bless you Tony, I remember everything like it was yesterday. High school was crazy, I remember mumbling the first Nii Nertey excused you from house duties. Later I fell ashamed that I complained. I remember in dorm A, I used to come and play cards. Never did I hear or see you complain. You have been strong from day one, God bless and continue to strengthen you. A lot of to be & new parents need education on this disease. This is a hard earned one, your service to GOD as a mass server is also not forgotten. No one has an excuse! We thank God for how far he has brought you. My husband also has sickle cell but he was not fortunate to have caring parents who could take him to the hospital when he had the crises. His right hip is now fused and he limps(possibly due to necrosis of the femoral head). I can only image the kind pain he goes through. This has not stopped him from achieving his goals. He is an accountant and has acquired his second degree in finance. Though he has been in constant pain throughought his life, we can only thank God for how far he has us. Thank you Adelaide. Your husband’s story is inspirational. Pls encourage him to submit an article to sicklelifemd@gmail.com. He could inspire many others too. Being my mate in the great Clerk house, i remember vividly most of the instances where you would experience some of these difficulties…and it was always a pitiful site, and i always felt sorry for you. The Lord has indeed been good to you and i know He shall bring to a great end whatever He has started with you….keep being an inspiration to others, bro. Thank you for your comment Kingsley. However, persons living with Sickle Cell disease do not appreciate pity or feeling “sorry for us”. We, like everyone else go through great effort to overcome adversity and we appreciate help and acceptance instead of pity. We appreciate your well wishes. I now understand why you were absent from the b-house most of the time. You’ve made it bro, God bless you and may His light shine upon you, as Rabi always reiterated. Thumbs up!!! Thank God for your life bro. You always caught my attention way back in high school with your sweater on most of the time. You are not alone my brother, I got to know i was one of your type when i gained admission to the university. Thanks to subsequent research on the disease i ve been able to cope with. We where in the same school. I really felt for him because his class and where his room was a distance it wasn’t EASY. All I can say is God is still at work.? We’ll always be with you like old times. you can always count on us and thank you for understanding us those years back we prevented you from playing football with us. your words have inspired a lot of people. keep it up Dr.
Wow God is rilli great congrats man!!!!!!! Wow.Am inspired by ur story. I want to know If sickle cell can Be hidden since someone said he detected it in the university. Also I think the education of sickle cell should be centered on prevention. Couples should be educated to check their genotypes before marriage. Sickle cell disease is genetic. One acquires it at birth. But the expression of the disease varies. Some start experiencing crisis as infants and some much later. But like you said, it’s better for parents not to risk it if they can. Everyone should know their genotype. Dear doctor, well done for achieving your dreams in spite of a difficult health journey. My observation is that you should not have been in a boarding school as a teenager because it is clear that you did very well health-wise when you lived at home. I am saying this to parents who have kids with any kind of chronic illness, boarding schools make look like the norm but in many parts of the world boarding school is the exception and kids will generally fair much better under the care of their parents. Again well done for inspiring others with your life story. When raising kids, let’s look at each one individually and make the best decisions for them. Interesting observation Adwoa, thank you. In Dr. Anemana’s case his entire family lived in the northern region and he only came to Accra for education. He had no alternatives. However, it is a fact that the level of care in the boarding house cannot be compared to that given by parents. Where possible the child should stay at home, but we do not want to exclude children living with sickle cell disease from quality education by this action. It is our hope that heads of schools will put in place necessary measures to cater for such children. In advanced societies persons living with disability (SCD patients are eligible for this in the US) are protected from exclusion from basic activities like work and education. The help is as simple as providing warm water to bathe and protecting them from physical activities which precipitate crises. Same as protecting a child with asthma from dust or keeping adrenaline syringes handy for a child with severe allergies. These children should not be excluded due to their health, however, their health and life is paramount. I am inspired by this awareness. I am a living testimony of this disease. It can’t be cured but I learnt to live with it. My greater crises was when I was in primary and jhs, even though I had some crisis in shs I had learnt the do’s and don’ts of the illness so I managed well in the boarding house. I am in my final year at the university of Ghana. God indeed has been faithful. To all the sickle cell patients out there let this disease not limit you. We can achieve greater heights. My sister lost her bff to sickle cell wen she was in primary 4 and I nearly lost her on the day her friend was buried (she passed out upon seeing her corpse and refused to wake up). We knew of her condition but never understood it. I also lost my dear friend to sickle cell in junior high year 1 and truth be told, he never told us he had sickle cell untill after his death. I felt sorry for the way I treated him in school when he refused to play with us as usual. If we had known about his predicament we wouldn’t (especially me) have been like ‘jerks’ to him. But now that I know a lot about sickle cell disease, I understand the pain that they go through. Indeed people should be educated on sickle cell and how to cope with people living with it. Dear brother the good lord will continue to protect you through out your life. God richly bless you. Indeed the only limitation is you. Your story is inpiring and interesting. To not have died but lived to tell this beautiful is proof that God is up to something great through you to other people. Keep the fire burning because you will always be a source of inspiration to some one out there. God bless. Am touched by your story Dr Anthony Anemana. I think we met ones or twice on campus(University of Ghana). Just as Joanita said, and I stress that couples yet to marry must go through test to know their sickle cell state before marriage because u don’t suffer but your offsprings. Dr. Please do keep in touch. Hi Dr. Anemana, your story is very inspirational. I pray that God continue to bless and keep you strong in your life’s journey. My late mum was also a Sickle cell patient. I lost her when I was just 4 years and I understand from family members that she had various crises. it makes me fairly understand the struggle that sickle cell patients go through. I tried to study more about it and have knowledge so that I know whom to marry. By the grace of God I’m married now with a baby girl. I’m AS and my wife is AA. God bless you and keep you. Nice reading your story. The journey is not easy but God always see us through. In my case my parent didn’t allow boarding hence was enrolled in a school nearby. I’ve been through the worse crises but I came out strong because we serve a faithful God. Sickle cell can’t be an excuse not to pursue our dreams. I am an Engineer and I love working in this field. Yes its tough working there but that’s what I want so I go for it. It’s all about knowing yourself and what triggers crises. This Journey is only for the strong. Congrats bro. I look forward to greater heights for people in our Journey. Thank you Nyamekye. You have done very well. Congratulations. We will love to hear your story in more detail. Maybe we can inspire others to also aspire to be engineers and work in your field. Pls submit your story to sicklelifemd@gmail. A classmate back in Habe halprin.. soo proud of you. You are a determined one. God surely would continue to bless you. You are a role model to soo many already. Woow I think I saw a forum like this where you share sickle cell stories. Never had the courage to share my story because i dont want people to know i’m sickle cell for some reasons personal. Ive lived with sickle cell my whole life and I thank God that now people dont even believe me when i say im SS. Even doctors doubt it. I think it is my constant workout at the gym and with the help of God im all muscular and people now doubt my status. Even my gym mates think Im equal as them since when it comes to strength i over all of them. Carry heavier wights than them. U get crises once a while and I thank God so much! You can check me out on instagram @cocoaasekrakye. Maybe I can be of help to my fellow Sicke Cell fellas! Congrats Frank. We are glad you don’t mind commenting and sharing your Instagram with us. Maybe you can tell us exactly how you stayed healthy while partaking in such intense sport as most persons living with sickle cell disease are prevented from partaking in sports due to fear of precipitating crises. We will definitely check you out. We are @sickle_life on Instagram. Your story is welcome at sicklelifemd@gmail.com. Inspiring story Tony….it’s been soo long please say hi to Linda and George. Very touching. My childhood friend went through a similar plight. At some point, she was withdrawn from the boarding house and taken to sec. school closer home. Coincidentally, she is now medical doctor too. But our children do not have to go through this anymore since there is a solution. There is technology called pre-implantation genetic diagnosis whereby the genotype of embryos is known before implantation. Hence, AS couples can preselect their embryos. For more information, visit us at medical Art Center, Lagos. Call us on 09094641948. Thank you. We will pass this on to our clients. Inspirational story Tony. U know we ll always be proud of you. THAK YOU FOR SHARING YOUR STORY . I have a friend who has to undergo a hip replacement surgery,i would like to know how was did the process go? Yessss really inspiring. Dr Anemana, we are proud of you. Detailing clearly the happenings of SHS. As honest as can be. Congrats man. You are a hard man. Overall best student in Surgery ? That’s awesome ! Amazing story there!! Keep moving forward and don’t let nothing stop u. This is life worth celebrating. God bless you. We thank God for your life n thanks for being inspiration to us,I think all health professionals should champion this course. I hope the awareness goes viral, especially to the hearing of young people who are planning to marry. They should know their status and that of their prospective spouses. I lost my best friend to sickle cell disease on January 12th this year, he was SS. His mum (who was AS) passed away last year, September 2015, and he also left 4months later. Such a difficult time for family and friends. This could have been avoided if parents had known their status before marriage. UNBELIEVABLE!!! When two ignorant black people have a baby without first going for screening, they later find out that they’ve given their baby SICKLE CELL DISEASE, through being totally IRRESPONSIBLE . But a doctor and a nurse?? ?